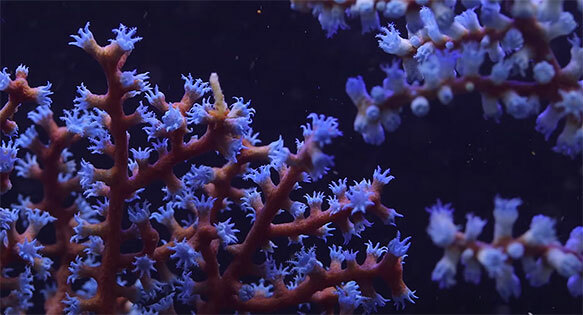 Than Thein’s latest video blog covers the often under-appreciated Gorgonians. Watch the video and read more below. Gorgonians (including Sea Fans) are a diverse family of corals that are found throughout reefs around the world. Despite their widespread distribution, they are not a particularly common coral in the reef aquarium hobby. 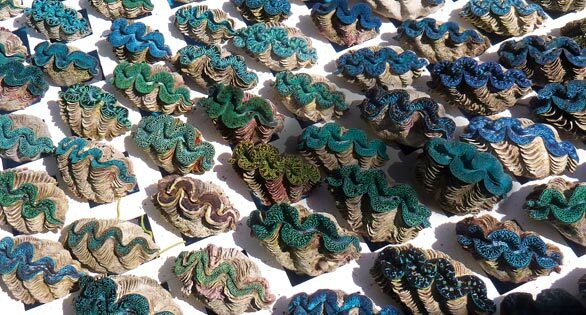 What sets them apart from other corals is the presence of a protein called gorgonin. Gorgonin gives the gorgonian a distinct leathery texture; it is similar to the touch to some soft corals, but is more rigid and gummy, as if it were made of cartilage. Gorgonin allows gorgonians to mimic the flexibility of a palm tree blowing in the wind. In the wild, gorgonian sea fans blow back and forth in strong surges while maintaining their fanlike shape. Gorgonians include both photosynthetic and non-photosynthetic gorgonians & sea fans, as well as sea whips that grow in a corkscrew shape. In the Caribbean, photosynthetic gorgonians are ubiquitous, and many of the colonies grow to giant sizes. The coloration of the Caribbean sea fans tends to be more muted purples, pinks, and shades of cream. In the Pacific, there are far more non-photosynthetic varieties that come in boisterous colors such as reds, yellow, blues, and there are even some that have rainbow-colored polyps. The problem with Pacific gorgonians is the “non-photosynthetic” part. Non-photosynthetic corals in general are a challenge to keep alive because they require regular feeding for proper nutrition. Filter-feeding non-photosynthetic gorgonians and sea fans are particularly challenging to maintain in captivity because of the shear quantity of food they require. In the wild, they have access to a nearly continuous supply of food in the water column, but this is practically impossible to reproduce on the hobby scale. Attempts to provide constant food availability often result in poor water quality, as most of the food goes uneaten and exceeds the filtering capacity of the reef aquarium. If you are looking to add a gorgonian to your reef aquarium, here are some practical tips: First, consider a photosynthetic specimen from the Atlantic rather than the mainly non-photosynthetic offerings from the Indo-Pacific. The level of difficulty between the two is worlds apart. Photosynthetic Caribbean sea fans and gorgonians are considered beginner-friendly while their non-photosynthetic Indo-Pacific counterparts require expert care and systems designed around the unique requirements of filter-feeding corals [editor’s note – two popular Caribbean gorgonians, the Red Finger Gorgonian, Diodogorgia nodulifera, and the Yellow Finger Gorgonian, Diodogorgia nodulifera, are non-photosynthetic]. Second, provide strong water flow. In the wild, you would be amazed by how much back-and-forth surge gorgonians receive. In addition to increasing access to food in the water, this helps gorgonians shed their skin every few weeks, a method of discouraging algae buildup on the body. I personally like wave devices such as a Tunze wavebox, which creates a nice, slow, back-and-forth surge. Third, whether you end up with a photosynthetic or non-photosynthetic sea fan, make an attempt to feed it. There are several manufacturers that make dry powder foods tailored to gorgonian nutrition. In particular, this food is designed to be the appropriate size for feeding gorgonians’ relatively small polyps, and is the appropriate density to remain suspended as long as possible, which provides sea fans the largest window of opportunity to feed. At Tidal Gardens, we have not tried them all out, but hopefully a mix of a few brands will be the key to healthy sea fans in the future. The fourth and final tip is in regards to lighting. Give the photosynthetic sea fans plenty of light. They are generally found in very shallow water and receive intense lighting during the day. Wow, I didn’t know that different areas produced such different gorgonians. I was considering getting some for an aquarium at my new apartment (the landlord doesn’t allow pets other than fish) and I’ll definitely be sure to ask if the ones I look at are from the Indo-Pacific or the Atlantic. I’m glad I read this before gorgonian shopping, or I might’ve gotten more than I could handle. Wow, I didn't know that different areas produced such different gorgonians. I was considering getting some for an aquarium at my new apartment (the landlord doesn't allow pets other than fish) and I'll definitely be sure to ask if the ones I look at are from the Indo-Pacific or the Atlantic. I'm glad I read this before gorgonian shopping, or I might've gotten more than I could handle.